Education and learning are the most important facilitators to gain a better society filled with calibre, courage, enthusiasm, individualism and ethical essentialities. It is strongly believed that under-education is one thing that might pull down a society, a country or the world to drastic levels. InSync believes in a society where education is provided to all and where no person is left out from the privileges of being educated; InSync has a clear motive to improve the society via education. For InSync, the thought of engaging themselves with other communities for better upholding the society is crucial. The most notable of all the initiatives taken by InSync is the Airtel Run for Education Marathon. The Airtel Run for Education Marathon is an annual marathon event organised by the Round Table India. Back in 2014, this was the first marathon here in Kolkata, the City of Joy, and since then it has become an eagerly awaited sensation for runners, philanthropists, and enthusiasts every year. This marathon - categorized into 5km, 10km and 21km races - aims at providing education to the underprivileged children of the country by bringing together people from all the classes and culture to contribute to the social cause - educating the young and the underprivileged. InSync's role in this fight against under-education along with the Round Table India clearly shows the motive - 'Freedom through Education'. Airtel Run for Education first flagged off in 2014 and InSync has been an integral part of this magnanimous event since its very inception. InSync has been steady to propagate the message of 'Education for All' through its continuous endeavours to enrich the society more with thoughts of excellence, success and empowerment. Mr. Atul Gupta, CEO of InSync Tech-Fin Solutions Ltd. believes in the reconstruction of the society through proper education and channelling; his deep-seated ideas of improving the community to a whole different level is the driving force behind the initiatives such as the Airtel Run for Education. Atul is also a member of the Round Table India which takes up the job of organizing such events for social improvements and apart from being an integral and esteemed part of the event as well as the community over the years, it is Atul's ideas and views which motivates and drives the force together. He said, "For us, the driving force is in the form of our values and it is something that we will continue to remain completely committed to." He is not only a member of the Round Table India, but also a fitness enthusiast himself - he has participated and represented InSync for the Airtel Run for Education from the very beginning. Atul believes in 'Learning by Doing' and has been successfully able to inculcate this idea among all his employees as well as the community. The InSync team's participation in the Airtel Run for Education over the years has been fabulous. Around 50 members of the company join the marathon each year to support the social cause of education to the underprivileged. The team itself motivates other runners and takes pride in supporting the cause. 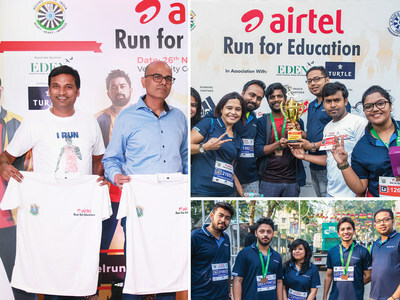 By creating a habit of running and maintaining fitness, the Airtel Run for Education has also impacted and changed the lives of many InSync employees - the marathon has evoked the idea of personal fitness and has changed the lifestyle of many employees from sedentary to highly active. The team has not only showed immense interest and enthusiasm in running in the event, but has also been providing support and expertise in areas such as designing, promotions and digital asset creation to make the event a huge success over the years. InSync has intently put intense effort and enthusiasm for the glory of the event - they have helped the Round Table India pave the way for the Airtel Run for Education. They actively participated in organizing and promoting the event and worked on several marketing strategies and has played a crucial role in popularizing it. Team InSync has set a benchmark for the future. InSync's sustainability and the Corporate Social Responsibility (CSR) are focussed at improving the lives of those who are a little less fortunate by providing them with educational essentialities. With the participation in events like the Airtel Run for Education, InSync pushes the people to run better and contribute to the cause which would shape the future of the country. The underlying motive has always been to create tangible impacts on the society for a better and sustainable future. All these contributions has helped the Round Table India to succeed in their objective of educating and spreading knowledge among the lesser fortunate - the Round Table India has been able to build schools and classrooms in the eastern region and has been constantly providing proper education via expert learning. Some of the notable efforts are the Sarada Sishu Mandir, Howrah, the Katadanga High School and the Champdani Ram Dulari Hindi high school. On the chilly morning of 26th November 2017, Kolkata witnessed the fourth edition of the Airtel Run for Education Marathon. Almost 8000 people from around the city joined in to help in the social cause behind the event. Kids, professional runners, old-aged enthusiasts, athletes, etc. all became a part of this event and contributed to it being a huge success. The event was flagged off from City Centre in Salt Lake, and the participation from around the city proved that InSync has been working on the right track and shares the concern of the common people. The Airtel Run for Education saw Rannvijay Singh, MTV host and the former U-19 basketball player, as the Face of the Event, who turned up to motivate and pump up the crowd - "Being fit is more important than looking fit," said Rannvijay. Atul Gupta was the Race Director for the 2017 edition and he made sure that all the participants were looked after carefully during the event. It was of the utmost importance for him to make sure that every aspect of the event taken care of properly so that the runners could enjoy their experience, stay high on motivation and take pride and honour for contributing in the cause for such social betterment. As the Race Director, Atul said, "I am more of a running event organizer than a runner. This creates an opportunity to get the masses into running and fitness." Team InSync actively participated in the marathon this year and was coroneted with the Most Vibrant Corporate Award. It is our belief that with endeavours like this, the society will one day have a chance for every educated Indian to be able to shape the country to a better and glowing future. We eagerly wait for the Airtel Run for Education 2018 and hope to contribute to the social cause with all might and vigour. About InSync Tech-Fin Solutions Ltd.
InSync Solutions is an organization based out of Kolkata, India and committed to the vision of transforming modern day businesses by equipping them with futuristic tools to make them more efficient and productive. Atul Gupta is the Founder and CEO of InSync Tech-Fin Solutions Ltd. and the Managing Trustee at Inspiria Knowledge Campus, Siliguri. An entrepreneur focused at building innovative solutions, his objective is to make businesses for efficient. He also actively encourages bridging the gap between the industry and the education sector.